Sometimes I just have to use everything up or throw it out. I call these kinds of dishes "compost salad" while La Maman calls them "plat unique". Last night I found myself in the kitchen with a bag of kale, a pint of cherry tomatoes, and half a container of mozzarella "pearls". The common denominator here was the fact that they were all within inches of their use-by date. And I cannot bear to throw away food, especially since so many people don't even have enough to eat. Now a word about chickpeas. Chickpeas are a staple in my kitchen, but they have to be Italian. If you buy ceci at Whole Foods it will cost you about $2.49 a can or something like that. If you go to Stop & Shop or the like you can get them for about a dollar a can. I usually buy 10 cans at a time. Believe me, you can't go wrong with having a good supply of chickpeas in your pantry. I began by roasting the kale. It was a GIANT bag of kale but it shrank down to a manageable amount when it cooked. Rinse the kale, pat it completely dry (or it will steam before it roasts which just takes longer), toss it with a little olive oil, cumin, salt, and pepper then pop it in the oven at 375 for like 15 to 20 minutes, stirring occasionally. It will be dried out and crispy/crunchy when it's done. 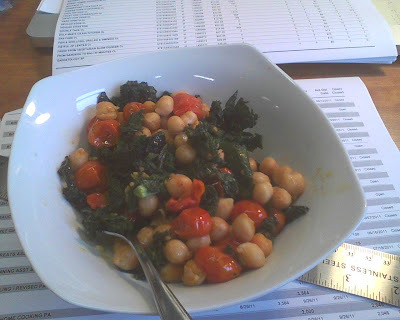 Then you want to saute a rinsed can of chickpeas with a rinsed pint of little tomatoes in a pan over medium high heat. 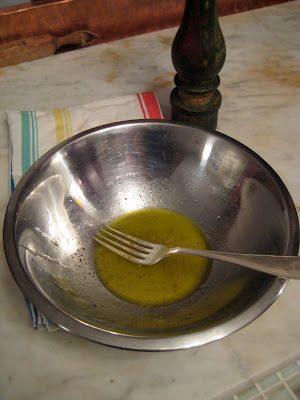 Use a little olive oil and add in a few clove of crushed garlic if you like. Cook the chickpeas and tomatoes together for about 10 minutes or so - just until the tomatoes soften and wrinkle and the chickpeas start to brown. In a bowl, whisk together a bit of vinegar with a bit of olive oil. Add salt, pepper, to taste. Then add in the mozzarella and toss to coat. 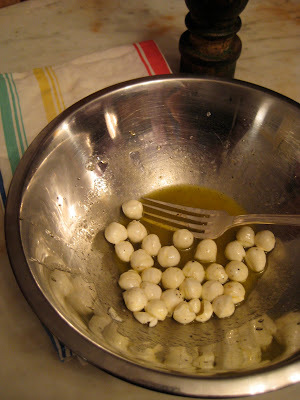 Scrape the hot tomatoes and chickpea mixture in over the mozzarella and toss to coat everything with the vinaigrette. The mozzarella will melt a bit and that is a good thing. Serve it on a bed of roasted kale. You will have enough for lunch the next day too! I am glad that I didn't waste anything and that the end result was really delicious. Because sometimes these kinds of inventions really taste like crap. Farmers to You is coming to me. Running water, where you going?